San Lorenzo Montessori strives to assist children attain the fundamentals of life at an early age. We focus on developmental skills that will enable a child to be independent, social, self-confident and to become life-long learners. At San Lorenzo Montessori (SLM) the children's potential is unlocked by providing them with a beautiful, enriched and challenging environment filled with age and size appropriate materials. 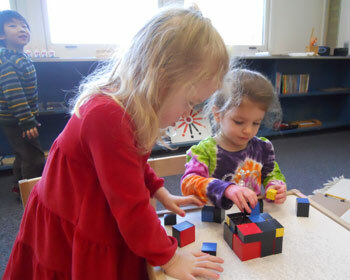 San Lorenzo Montessori's Primary program accepts children age 2¾ to 5½ years old. The classroom offers a half day, five day a week program for children 2¾ years old to 4½ years old, called the Children's House and a full day, five day a week program for Kindergarten age children called the Extended Day. Both Children's House students and Extended Day students are in the same classroom. 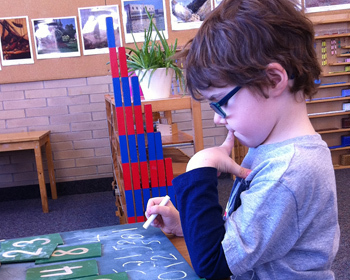 At San Lorenzo Montessori we believe in helping to develop each student's independence, concentration, and problem solving abilities, and that these fundamental skills are the key building blocks to a child's future success. Our desire to create a "True Community" within the school allows the staff, in conjunction with parents, to create a place of belonging for their children. 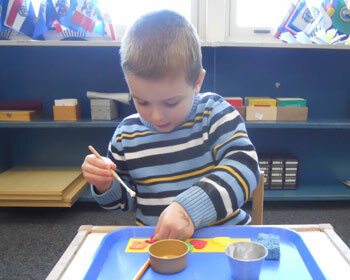 This naturally leads to a nurturing environment where the children can work towards developing their fullest potential through their work with the Montessori materials.